Take half a pint of [Tierilboyle] half a tb. of read lead half a penny worth of bees wax warn ye oyle blood warme. Then put in ye red lead stering it all ye while with a slice, and when it is well boiled take the slice and dip it into a paile of clean water. 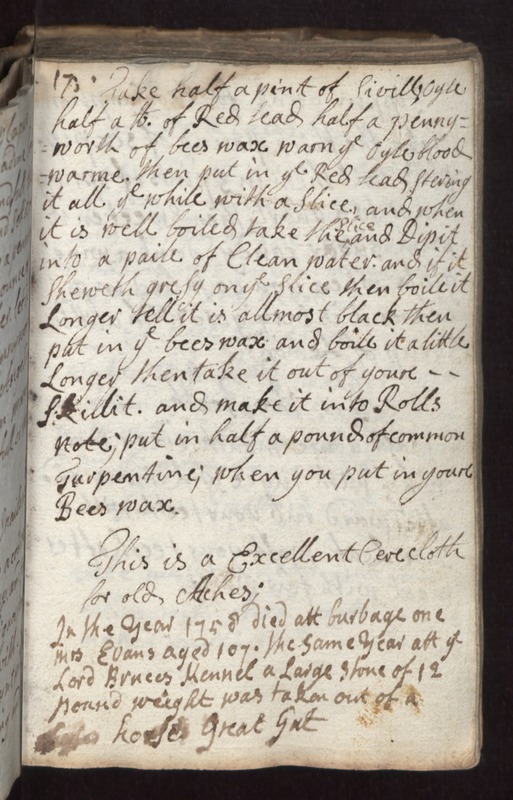 and if it sheweth gresy on ye slice then boile it longer tell it is allmost black then put in ye bees wax and boil it a little longer then take it out of youre [skillit]. and make it into rolls. note; put in half a pound of common turpentine; when you put in your bees wax. This is a excellent [cerecloth] for old [chihes]. In the year 1758 died att burbage one Mrs Evans aged 107. the same year att ye Lord Bruees Hennel a large stone of 12 pound weight was taken out of a [illegible] horse great gut.